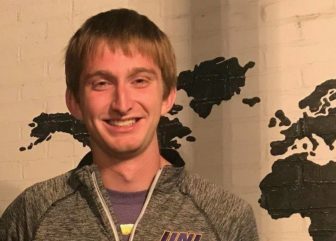 Dylan Miller spent $495 on college textbooks at the University of Northern Iowa – $167.50 for a linear algebra textbook – in the spring semester just ending, yet said he might have used the books, perhaps, once a month. The internet? Used it close to two hours each day, he said, raising the issue of why he still buys textbooks. A lot of college students are avoiding textbooks costs that generally can range from around $20 for a book on writing grant proposals to $400 for a physics book, a spring IowaWatch/College Media Journalism Project revealed. In lieu of buying, they rent books, which can save an average $29 per book, depending on the subject. They also rely on information they can find on the internet, sometimes as a first reference. “Absolutely not,” Crehan, 21, a William Penn University junior from Troy, Illinois, said. Crehan, with a major in business management, said he paid $827.45 for all of his textbooks this spring semester. The most expensive was Robbins & Coulter, Management, 14th Edition, for $240.25. Textbooks used by students interviewed in the IowaWatch/College Media Journalism Project included $116 for practical guide to early childhood, $167.50 for linear algebra, $200 for sports law, $240 for business management, $251.50 for technical math and $300 for an income and measurement textbook. The College Board estimated in its most recent report, for 2017-18, that the cost of books plus other course materials a student would need for classes cost an average $1,250 for the school year. That is a relatively small portion of the estimated $25,290 the College Board estimates it costs to attend a four-year public college and $50,900 to attend a four-year private non-profit college in the United States. The National Association of College Stores shows college students paying an average of $579 for required course materials and another $506 for technology and school supplies for the 2016-17 academic year. The costs for required course materials only is down from $701 in 2007-08. The reasons for lower required costs boil down to students increasing their use of free or digital school materials and renting course books, the association reports. The days when every student decides against buying textbooks have not gone away. Interviews in the IowaWatch/College Media Journalism Project showed that the more technical the major, the more likely a student purchased and wanted to keep a textbook. These majors were in fields such as chemistry, mathematics, pre-med and computer science. “Renting’s not too bad but I’ve bought, I would say, every major class that I’ve had,” Josh Hoffman, 21, a graduating senior from Buena Vista University, said. His major is athletic training. 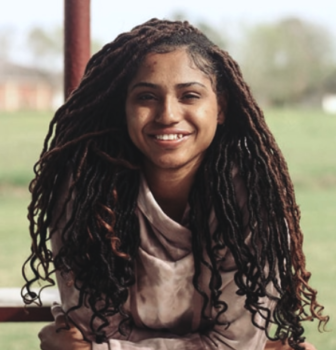 Kiara Nicole Davis, a sophomore from Thibodaux, Louisiana, at William Penn University this past year, said she used a $15.20 calculus textbook every day, weekends included. “I got more use out of my calculus textbook than what I paid for it,” she said. Jamie Pritzker, 22, said she didn’t buy any books during her fall 2017 semester at the University of Iowa, where she was wrapping up her college studies this month with a major in cinema studies and minor in criminology. Student journalists in the IowaWatch/College Media Journalism Project interviewed more than three dozen students at the University of Iowa, Iowa State University, the University of Northern Iowa, Buena Vista University, Loras College, Simpson College and William Penn University in the middle of the spring semester this year. Simpson students, for example, said they have spent between $100 and $400, maybe more, on textbooks per semester. Victoria Jordan, 19, a sophomore at the Indianola college this past school year, spent $400 this past semester. Her most expensive book costing $190 total, with an online access code, was for a chemistry class, she said. Switching majors during college can add to the costs as students’ purchase textbooks for one field of study, only to need books from a different one later. Joaquin Reyes, finishing his senior year, began at the University of Iowa as a pre-med student before transitioning to computer science his sophomore year. Reyes, 21, of Bartlett, Illinois, said he spent $400 to $500 on textbooks in each of his first three semesters. Reyes said he knew better to find cheaper options after his third semester, when he switched to computer science. He said freshmen are vulnerable to spending too much on textbooks because they are not as aware of cheaper options such as renting, buying used books or buying from websites like Chegg and Amazon. How much professors teach and assign from the textbooks varies from one professor to the next. Some assign the whole book, while others assign sections. Heather Dean, course materials manager at the Iowa State University Book Store in Ames, said value is all about how a book is used. Dean said publishers set book prices and that the University Book Store upcharge only is enough to cover operating costs. A University of Iowa Undergraduate Educational Policy and Curriculum Committee required that professors order textbooks for the next semester before summer break, to give students more time to calculate the cost of their textbooks and find the money to purchase them. Risks exist with that approach. While students can plan, professors risk using outdated materials, Rachel Williams, associate professor in the gender, women’s and sexuality studies department at the University of Iowa since 1999, said. Williams is a member of the policy and curriculum committee and did not require textbooks in the spring semester. She primarily uses in her classes scholarly articles and readings obtained through the University of Iowa Library database, as well as current articles, news stories and blog posts. Articles obtained through the library or library databases can be reproduced and distributed for educational purposes. This allows her to teach the most current, relevant information for her classes, she said. It also allows her to tailor her teaching materials to her courses better without making students purchase a textbook that may only have a few relevant chapters. It wasn’t that long ago that the internet was considered in academia a suspect place for information. But source material is posted there, and college teachers are willing to point students in its direction. 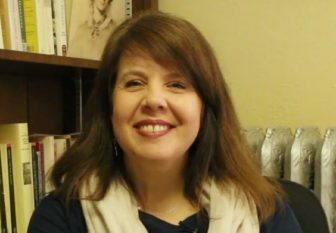 Erin VanLaningham, associate professor of English at Loras College sometimes sends her students to the internet instead of forcing them to buy an entire book of short stories for just one assigned story in her class. “I’ll definitely post a link instead of requiring students to purchase the entire book,” she said. Austin Claussen, 22, a graduating Iowa State senior in industrial technology, said he had to choose between two required books this spring because he could not afford both. “I wanted to buy at least one other book but … it’s for a robotics class and it was like $200 and I didn’t have $200 to spend on that book,” Claussen, from Davenport, Iowa, said. Dalton Grell, 22, a fifth-year senior this school year studying supply chain management, got creative when he saw a required textbook, “Spreadsheet Model and Decision Analysis,” that cost $306.70 at the University Bookstore. He found it online for $110.59. “That one I bought on Amazon, so I could get the European version of it,” Grell, from North Liberty, Iowa, said. Grell had a recommendation to students who are new to purchasing textbooks and holding a list of required books. “Wait until you go to the first couple days of class, see what the professor says,” he said. IowaWatch’s Lyle Muller contributed to this report. This IowaWatch story was republished by The Courier (Waterloo, IA) and The Hawk Eye (Burlington, IA) and portions were published by the Iowa State Daily (Ames, IA) and LCTV at Loras College (Dubuque, IA) under IowaWatch’s mission of sharing stories with media partners.